Around the tourist destination with a guide. You can choose from four types. Medix Taxi provides tours to international customers and tourists. Medix Taxi provides an English-speaking guide free of charge (advanced notice is required). Around Hida Takayama there are many popular places of interest like Shirakawa-go, Hida Furukawa, Kamikochi and Shinhodaka. We recommend our comfortable taxi to visit these places. 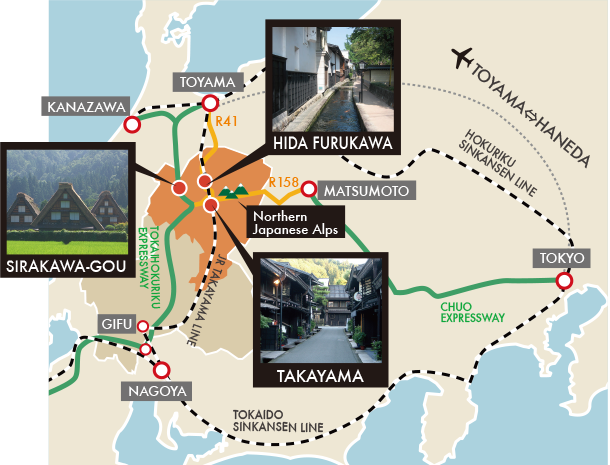 We suggest taking a taxi to visit Hida Takayama, Hida Furukawa, Shirakawa-go, Kamikochi and Shinhodaka. We are looking forward to your reservation. In Hida, there are many places one can visit all year round. Both Shirakawa-gou World Heritage Site and Kamikochi are about an hour from Takayama by car. We offer a variety of interesting tours or you can design your own.